A major component of the Initiative is mapping and assessing the geomorphology and flow hydraulics of streams throughout the watershed, and as well as measuring the flow hydraulics and transport of sediment and nutrients in the river. 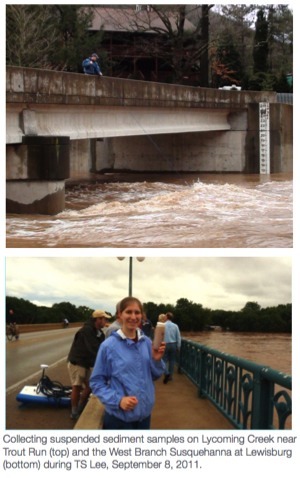 Since the infrequent, high-magnitude flow events perform the most geomorphic “work” (tractive force of the water times exerted over a length of channel) on streams, we often venture out during storms to collect data over a range of flow conditions. Using state-of-the-art hydroacoustic instruments we can now measure flow velocities in three dimensions across the entire water column, which greatly improves our discharge and shear stress estimates. Suspended- and bedload-sediment samples are collected from bridges spanning the river using portable cranes; the data are used to calculate the volumes of clay, silt, sand, and gravel being transported by the river. For example, during Tropical Storm Lee, we estimate the West Branch was carrying at least 427,000 tons of suspended sediment per day — that’s the equivalent of 28,500 dump trucks of sand and gravel! This information is of great interest to U.S. Geological Survey, the U.S. Environmental Protection Agency and the Chesapeake Bay Commission. It improves our understanding of sediment erosion, transport and depositional processes in the river, how pools and riffle habitats are created, and the bathymetry and morphology of the channel. We hope to expand our monitoring of the river to learn more about the source areas of sediment and pollution in the watershed and how it affects the water quality and aquatic habitat in the river.